Poori Bhaji | My Cooking Diaries "CooklikeCecilia.com"
Sieve the flour with the salt and add a tbsp. of oil and mix with your fingers thoroughly. The flour should form a soft lump if pressed together in your palm. Mak a bay in the flour and pour water about half cup and start mixing gradually. When fully mixed, knead to make a dough, cover with a moist cloth or a bowl and leave to rest. Meanwhile make the potato bhaji (as below). Divide the dough into 20 to 25 portions and roll into a ball in between your palms.. Apply a little oil on both sides of each portion and flatten each with a rolling pin into round discs about 4″ in diameter. 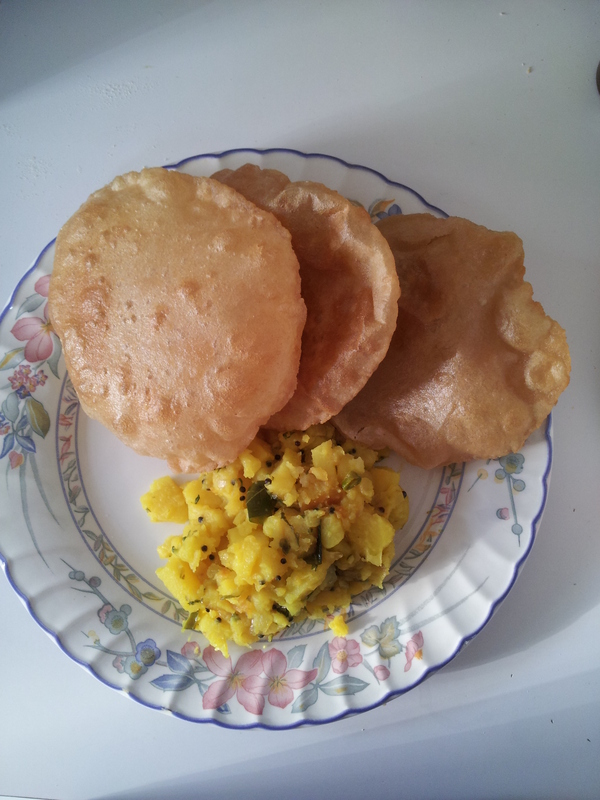 Heat oil in a kadhai and deep fry the poori until golden brown, turning once to ensure it piffs up. Serve hot with potato bhaji. Peel and wash potatoes well. Cut into small cubes. Heat oil, add the mustard seeds. When the mustard seeds stop spluttering, add the curry leaves, green chillies, onions and fry till light brown. Add the turmeric, potatoes and salt and toss lightly. Then add 1 cup hot water and simmer till the potatoes are cooked and oil surfaces. Add the lemon juice, chopped coriander leaves, mix well and adjust seasoning. Simmer for 2 minutes and remove from heat.